Since concrete is a brittle material and is strong in compression. It is weak in tension, so steel is used inside concrete for strengthening and reinforcing the tensile strength of concrete. 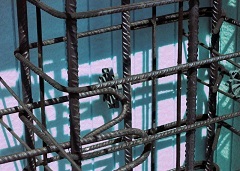 The steel must have appropriate deformations to provide strong bonds and interlocking of both materials. When completely surrounded by the hardened concrete mass it forms an integral part of the two materials, known as "Reinforced Concrete". Serviceability: No excessive deflection, no excessive deformation and no cracking or vibrations No excessive reinforcement. Must be able to perform the function, it is built for. This design concept is based on elastic theory, assuming a straight line stress distribution along the depth of the concrete. The actual loads or working loads acting on the structure are estimated and members are proportioned on the basis of certain allowable stresses in concrete and steel. The allowable stresses are fractions of the crushing strength of concrete (fc') and the yield strength (fy). Because of the differences in realism and reliability over the past several decades, the strength design method has displaced the older stress design method. Modulus of elasticity for all grades of steel is taken as Es = 29 x 106 psi. The stress in the elastic range is equal to the strain multiplied by Es. Concrete's tensile strength is about 1/10 of its compressive strength. 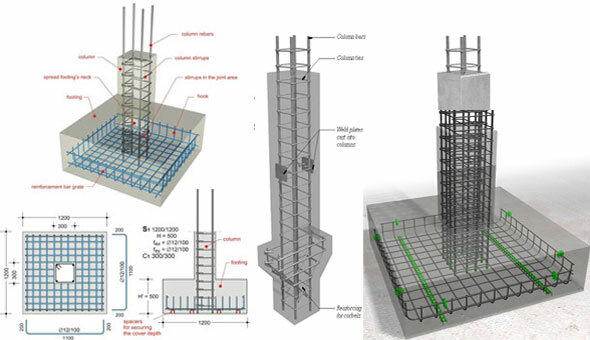 Structural members must always be proportioned to resist loads greater than service or actual loads, in order to provide proper safety against failure. In the strength design method, the member is designed to resist the factored loads which are obtained by multiplying the factored loads with live loads.